A plethora of cable television channels and video games consoles make it all the more difficult to drag the children away from the screen and outdoors for some valuable physical exercise. While the challenge for parents is one of ensuring that their kids stay happy and healthy and interact positively with their peers through game play, the administrators at the top of individual professional sports face an equally important task; namely to ensure that the talent pool does not run dry. More urgent even than looking for the next generation of elite players, large numbers of young people simply playing a sport for fun mean that it retains its place in the public imagination. The alternative is too horrifying to contemplate – namely that it is consigned to the margins, to be labelled a ‘minority sport’. While cricket remains the number one game for the Indian sub-continent – you can lose count of the number of children competing with bat and ball from dawn to dusk – the situation in its birthplace, England, is not so healthy. Which is why the past few years has seen the England and Wales Cricket Board, the national governing body, invest in programmes aimed at ensuring five-year olds and upwards are afforded the opportunity to sample a piece of the action. One of the main considerations when drawing up these development programmes was the issue of safety, and this is reflected in the organisation and equipment involvedfor younger children, Asda Kwik Cricket, organised in conjunction with primary schools and affiliate clubs, offers a number of formats suitable for either outdoor or indoor play as well as an awards scheme to encourage development of the core skills of batting, bowling and catching. Rules that provide the opportunity for the participation of players with a disability mean that no-one has to miss out on the fun. Equipment specifically designed for Kwik Cricket is manufactured from moulded plastic, and is light but tough to survive the often less than subtle attentions of aspiring young cricketers. Each kit comprises bats, balls, and two sets of stumps with detachable bases.In addition to Kwik Cricket, the ECB promotes Urban Cricket, a concept whose first rule is: there are no rules. Rather, the idea is that the game can be played anytime, anywhere without the need for a specific playing area or any equipment apart from a plastic bat and tennis ball. Older children are the target audience for the Inter Cricket concept, so called because it forms an intermediate stage between Kwik Cricket and the standard form of the game. A rubberised ball replaces the traditional hard, leather bound one with the addition of coloured clothing and equipment. A portable, plastic pitch has been designed, too, called Flicx, which allows the game to be rolled out across a number of surfaces. 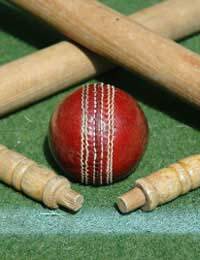 To ensure the development of core skills, elements of the traditional game form part of Inter Cricket. The fun element lies at the heart of all these initiatives. Of course, if they also are responsible for identifying a future county or international player, then so much the better. In the meantime, a new generation of children is receiving a valuable introduction to one of world sport’s great games, and countless parents are seeing the results in fitter children who are discovering excitement and healthy competition far removed from the TV screen.